It's a tad bit hard to believe that this is our silver jubilee episode for the Dubplate sessions. 25 artists and each time a unique set of thoughts along with a splendid mixset. Such a journey it's been. Also, it's our birthday week. How time flies! We've come across a bunch of new artists [both producers and DJs] in the last one month, and listening to their tracks/sounds, connecting with them, all of it comes with a feeling of excitement with an unexplainable sense of pride and happiness. 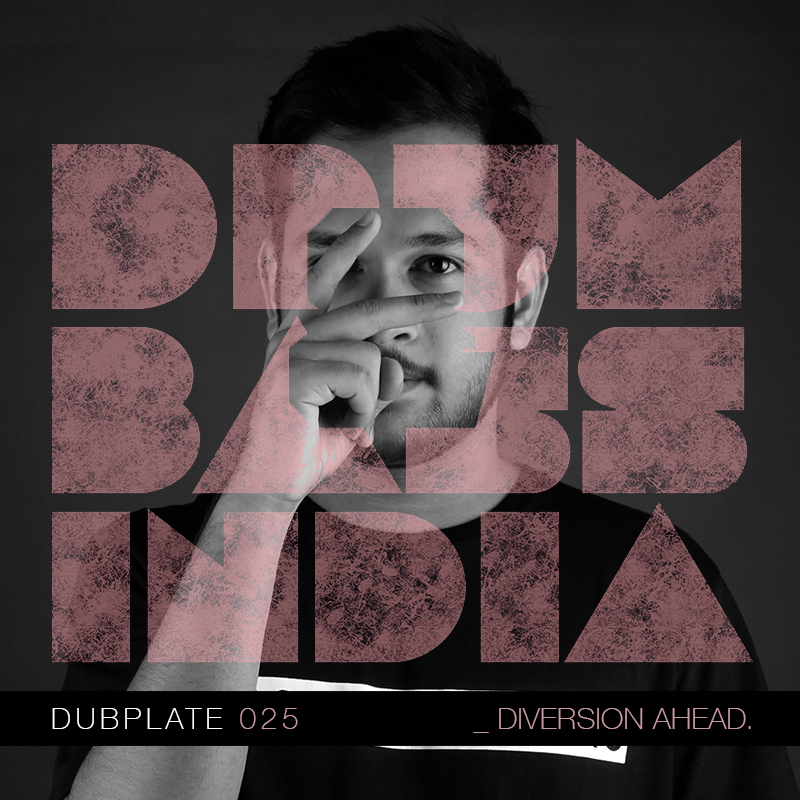 For the 25th feature, we are delighted to have Aditya Malve, a multi genre producer, working with DnB under the name - DIVERSION AHEAD. An audio engineering student based in Pune, Aditya has released a few tracks [along with an EP] by now and is working on a brand new Drum and Bass EP, which is to be released soon. We had a casual chat with him, read up, while you listen to this exclusive set he made for us. 1. How are you doing, Aditya? To begin with, tell us more about the Diversion Ahead moniker. How did it all begin for you? A - Hey! It’s going good, been really busy! I’ve been producing under the alias ‘Aditya Malve’ roughly for 5 years now, I needed an alias where I can experiment with my music. I was looking for an artist name, going through random things, both online and offline. And while on this road trip to my hometown, I saw the sign board that says ‘DIVERSION AHEAD’ which sounded interesting to me and would also fit the style of music I thought. That’s where it all began. 2. Having experimented with multiple genres, do you believe that Drum & Bass is your stand- out sound? A - Umm… I don’t really think so. I really like experimenting my music with other musicians. I like collaborating with musicians (not producers) and creating a hybrid combination of electronica music. I don’t have any stand out as such, you can listen to the experimentation in my EP ‘Beyond Infinity’ which I released last year with Gently Altered. I’m working a lot a of Drum & Bass tunes, putting out an EP in a few months. 3. We want to pay close attention to Port Royal and Atomic Clock. The former is a gorgeous slice of Liquid drum & bass and the latter is a deep, punchy roller. How fluent was the production process while working on these projects? A - Port Royal is one of favourites. I produced together with Quistek (DJ/Producer, Pune), we had been working on other Drum & Bass tune which didn’t really work out. lt took a while to get the track structured. Once we got track structured right, I sent it to Raunak Barde (Guitarist/Vocalist, Lunar Waves) who’s a mad guitarist, he played an ARP & a solo which I fell in love with. Guitars with Drum & Bass was something which I’ve never heard before, it still sounds fresh. Atomic Clock is one of those tracks which you make in a day & spend two weeks detailing, haha. Both tracks have a story within themselves. I’m open to all genres, like experimenting with everything I work on. 4. We have seen a lot of Drum & Bass artists having a deep connect with House and Techno. What do you look for when you dig genres other than Drum & Bass? A - Knew this one would be coming. *giggles*. I play Deep House & Progressive Deep under the alias ‘Aditya Malve’, and really enjoy deep & melodic vibes. Love playing long deep house sets. Other than that, I like listening to Indie, Electronica, Psychedelic Rock, Progressive Rock as well. I have also had an inclination towards in Jazz recently. So, it could really be anything with good musical content. 5. What are your thoughts on the concept of Live drum & bass? A - That’s something I really dig into, very few artists who perform Drum & Bass live. I’m working on an entire live DIVERSION AHEAD. show with Raunak Barde (Guitarist/Vocalist, Lunar Waves) who’s a really maaaaaaad guitarist. We’ve got around 4-5 tracks together, I love anything he plays. Also having Saranik Dutta on the Drums, who’s a killer drummer. Saranik loves playing Drum & Bass grooves. But it’s been a little difficult to coordinate with time, since everyone’s busy with their own work. But things are falling into place, slowly and steadily. 6. Of all the drum & bass/electronica artists around, whose music moved you and drove you into producing music? A - It’s been 5 years that I’ve producing like I mentioned before, and there was a certain limition to music as I didn’t have enough access to the internet. I only had some collection of Pop & EDM during the time I started producing. David Guetta had some really good music out in 2012, his albums were gold. That was something which was new to me and I was curious how it is all made. So I discovered this software called Fruity Loops, fidgeted, explored and self learned with the help of online videos. Later, I started discovering new genres, artists. Subfocus & DJ Fresh were first Drum & Bass artists I discovered. Later I shifted to Ableton, which made it easier for me to produce the kind of sounds I wanted to. Now I’m really inspired by sounds of Flexout Audio (Record Label sound in general), Mr. Bill, Tipper, OX7GEN, Dualist Inquiry, Skanandbass, DIVISION records just to name a few. 7. What is your ideal downtime when you are not making music/studying? A - Well, I don't exactly know how to answer this one, haha. I’m currently pursing my Audio Engineering in Pune, so I’m around sound all day. I constantly seek for information about Audio. I also practice Piano and enjoy solving Rubik's cube. 8. Five tunes you are feeling at the moment? 9. You are headlining the mainstage at Let It Roll in front of a massive crowd. What will be your opening track? A - Camo & Krooked - Come Together. Follow DIVERSION AHEAD | Facebook | Soundcloud. Dubplate #025 - DIVERSION AHEAD.